Dating back more than 20 years ago, when I would regularly frequent the late Ernie Butler's original Comedy Nest, one of my favorite standups was NDG's very own Sean Keane. His dry humour and unique delivery was rip roaring hilarious. I bump into Sean from time to time at Provigo in NDG and we talk about old times. He is a modest fellow and took a lot of prodding for me to find out that he recently returned from an appearance at the Winnipeg Comedy Festival, which was broadcast on CBC TV. Here is a link to his set. Just click on the third dot and wait for the commercial to end. During this broadcast, host Jon Dore explored the boundary between good and bad behaviour with very funny guests Keane, John Wing, Darren Frost, Shazia Mirza, Mike Ward, Elvira Kurt, and Dan Licoppe. Who exactly is the man behind Dancap Productions? Montrealers are probably very fortunate that Aubrey Dan is so familiar with our city from his days working in the family business, Dan was appointed to run Novopharm Limited and the Novopharm subsidiary, Wampole Canada Inc., an herbal supplement and vitamin manufacturer. Dan will be back here on March 13 when Dancap brings the Canadian premiere of Shrek the Musical to Place des Arts for a six-day run. He already had it booked for the Toronto Centre for the Arts, March 20 to April 1. Cognizant of the fact the PDA has a lot more availability these days since the Symphony Orchestra moved into its own digs, Dancap has made its move. With experienced promotions expert Claudette Dionne on board, all signs post to a successful experience here which would open the door to a lot more of their productions. Jersey Boys and Memphis are just two more that could get the green light down the 401. Dan is a Canadian businessman, Tony-Award® winning producer (MEMPHIS), impresario and philanthropist. He is founder and president of Dancap Private Equity Inc., Dancap Global Asset Management, Dancap Catering Inc., and Dancap Productions Inc. Born in Toronto, he graduated from the University of Western Ontario with a degree in Administrative and Commercial studies in 1985. Soon after, he joined Novopharm Limited. In 2002, he founded Dancap Private Equity, a private firm that invests its own funds from a $50 million investment base in mid-market Canadian businesses, and as co-investment partner for medium to large sized international businesses. Dan also founded Dancap Global Asset Management, a company with a singular mandate to build wealth over the long term by providing best practices in asset allocation, portfolio construction, investment due diligence, and investment management. The company's investment focus includes alternative assets, such as private equity, private debt, infrastructure, commodities and hedge funds, as well as traditional assets including public equities, fixed income and real estate. In 2007, Dan launched Dancap Productions with an inaugural season that included The Drowsy Chaperone, The 25th Annual Putnam County Spelling Bee, 3 Mo Divas, successful revivals of beloved shows like My Fair Lady as well as summer presentations Of Avenue Q and the Tony Award®-winning Jersey Boys. After a two year run with Jersey Boys, Dancap Productions returned to presenting a subscriptions series of award-winning Broadway theatre. Dancap’s 2011 subscription series featured the Canadian premiere of five new musicals direct from Broadway: 9 to 5: The Musical, based on the hit film with music and lyrics by the incomparable Dolly Parton; Next to Normal, the most talked about show on Broadway and winner of the 2010 Pulitzer Prize for drama; Come Fly Away, Twyla Tharp's electrifying celebration of the music of Frank Sinatra; The Addams Family, a new musical based on the TV and film characters; Memphis, , winner of the most awards in the 2009-2010 Broadway season including the Tony Award for Best Musical; and the return of The Lincoln Center Theater production of Rodgers & Hammerstein’s South Pacific. Coming up next is In the Heights, the Jersey Boys Tour,West Side Story, Beauty and the Beast and AChristmas Story. Aubrey Dan is a very generous philanthropist, donating millions of dollars, primarily to health and education charities, and other worthy causes. Together with his wife Marla, the Dans have donated more than $20 million to organizations that include: Sunnybrook Foundation for their women and babies program, now called the Aubrey & Marla Dan Program for High Risk Mothers & Babies ($8 million); University of Western Ontario's Social Science Department, resulting in the program being named the Aubrey Dan Program in Management and Organizational Studies ($5 million); Baycrest Centre Foundation in honour of his father-in-law Reuben Cipin ¬– Reuben Cipin Healthy Living Community in Toronto ($5 million); the Judy Dan Wound Care Centre (named in memory of Dan’s mother who passed away in 1995 due to Diabetic complications), whose work focuses on preventing unnecessary amputations and reducing patient suffering by treating diabetic wounds with hyperbaric oxygen therapy (in excess of $700,000); University of Toronto Leslie Dan Facility of Pharmacy in honour of his father ($2.0 million). Dan received an honorary Doctorate of Laws Degree (honoris causa) from Assumption University in 2008. He is a member of the Young President's Association (YPO) Ontario Chapter, Baycrest and Institute of Private Investors (IPI). Dan is spending a lot of time in New York City these days for what promises to be huge it: Prince of Broadway. The new musical will debut next November, celebrating legendary Broadway director and producer Harold “Hal” Prince. It will in fact forgo the pre-Broadway engagement in Toronto. Prince of Broadway will feature words and music from the shows that have earned Hal Prince a record 21 Tony Awards. Claudia Litvak Polachek is grateful to be part of Montreal’s vibrant Jewish community. As the happily married mother of three and a noted community activist, she has made her presence felt her over the years via her involvement with a number of organizations. However, it was not for happy reasons that she and her family immigrated to Canada from Chili when she was only four years old. Litvak Polachek’s nephew got leukemia when he was only six years old. While he beat the disease and is today a healthy 21 year old, her uncle was not so lucky. He was diagnosed with leukemia eight years ago and passed away five months later. 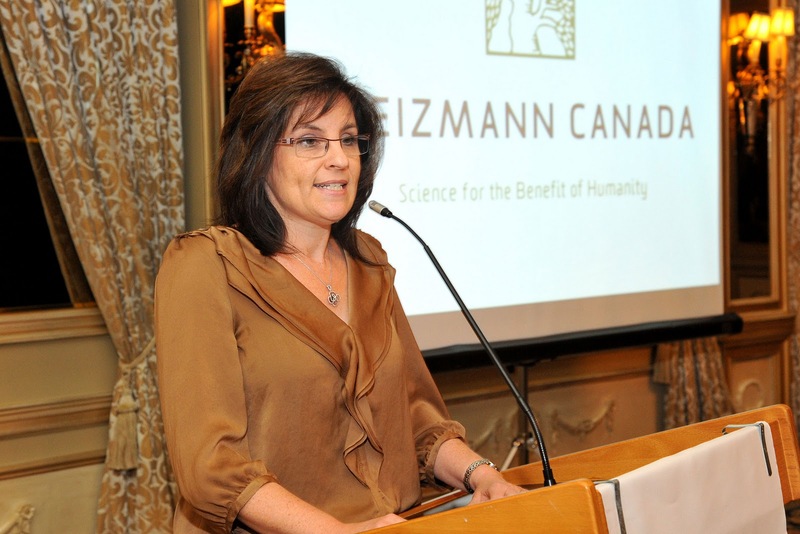 Given the degree that leukemia has touched her family, Litvak Polachek has decided to focus attention in her role as Women and Science Chairperson of Weizmann Canada to raise $110,000 for much needed equipment at the Weizmann Institute of Science in Israel to further their important research on the disease. As of this writing, more than half the funds have already rolled in. On Wednesday February 8 the Segal Centre for the Arts (5170 Cote St. Catherine) will be the site of an exclusive cocktail dînatoire and a special presentation of the play Scientific Americans. One of the most rewarding aspects of this project for Litvak Polachek has been the support she has received from husband Garry and her three children, Jacob, Nathanial and Hanna. The boys are part of the B’nai Tzedek Program for kids celebrating a bar or bat mitzvah to get a real idea of what tzedakah is all about. Money they received as gifts are set aside in a special individualized Jewish Community Foundation Fund. Once a year, they choose what charity and/or Jewish agency they would like the accrued interest from their individual funds to go to. For more information about the event, called Claudia’s Hope for a Cure, call 514-342-0777 or log on to http://itsinourblood.weizmann.ca/.